I look at the little girl in the photographs below and I see so much of myself in her. And I hope she'll beat to the tune of her own heart as I try to. I hope she'll tell the people in her life, close or distant, how much they matter as I do. As often as possible. Because in the end, it's what counts. Truly. I hope she has the courage to take chances, get hurt, and love again. To be imperfectly alive. As my friend Brene says "it will confuse and terrify people" but I will be there if she needs me. She is a part of me. My niece Lea. She's turning ten on Monday and this post is for her. Being ten is a big deal. I know! I see so little of her over the years that everytime I feel like meeting a different person. I love how my brother and his wife are raising her and her sister. It's chaotic, it's loud and imperfect and it's full of laughs and love, hugs and stories. I was so happy to spend some time alone with her while visiting my parents this summer. We took some time out to go about their village, talk about life and take some pictures. We also spent an afternoon baking up a storm together! First there was this lovely Mirabelle and Almond Frangipane Tart and then we made a couple of batches of cinnamon rolls. I had made them for the family one Christmas 4 years ago and knowing how much her dad loved them, she insisted we made some more. I'm warning you right now, these are not gluten free. I was tempted but I was not home, did not have everything I needed on hand, the equipment and oven were different so I stuck to the original recipe, a knock off version of Cinnabon™ Cinnamon Rolls. 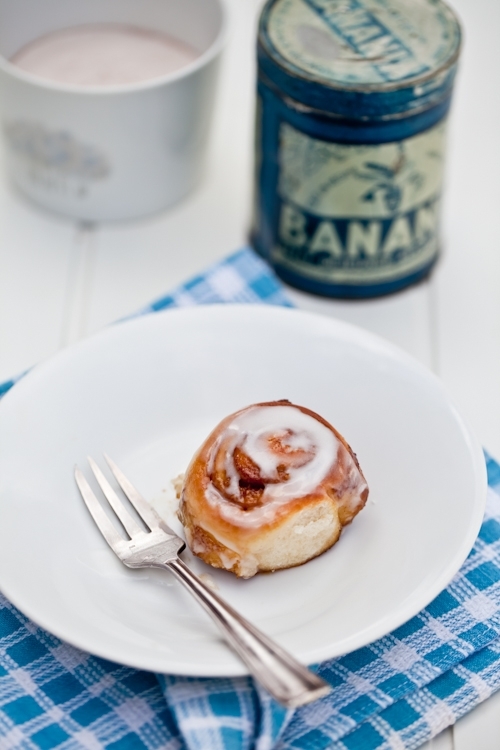 For a gluten free equivalent, please check out Shauna's cinnamon rolls here. Magic. Please, meet my gorgeous niece Lea in this cinnamon rolls 101. Happy Birthday Sweetie - Joyeux Anniversaire ma belle! Once your dough has risen and is ready to use, flour your work surface abundantly. 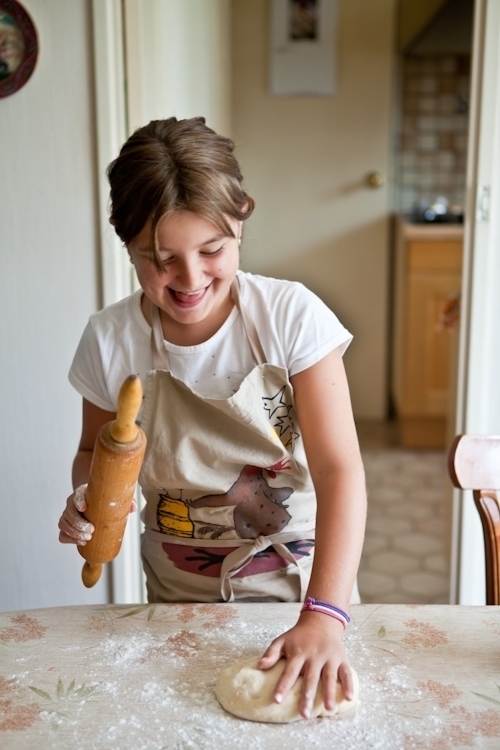 Get your rolling pin and your smile on - this is going to be good! Liberally sprinkling dark brown sugar and cinnamon over the dough. Rolling the dough into a log. Cutting the log into roll size pieces. As I was taking pictures outside before a huge thunderstorm hit us, I looked over my shoulder and this is what I saw. And my heart jumped with excitment...A budding food photographer. Yes! Dissolve the yeast in the warm milk in a large bowl. Knead the dough into a large ball, using your hands lightly dusted with flour. Put in a bowl, cover, and let rise in a warm place about an hour or until the dough has doubled in size. Roll the dough out on a lightly floured surface. 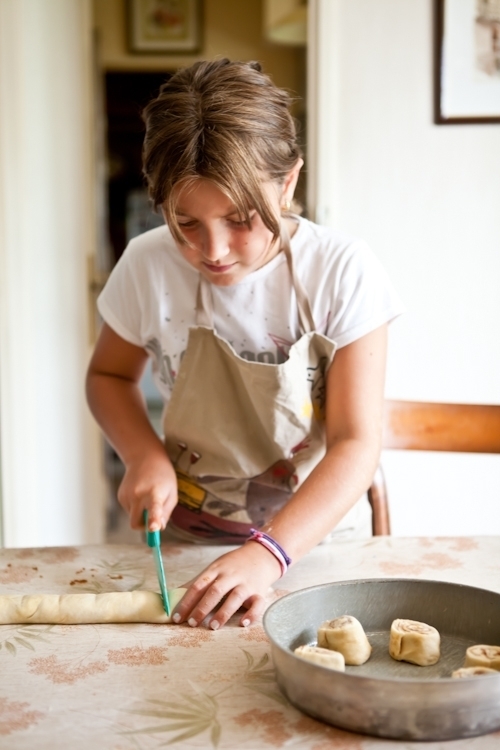 Roll the dough flat until it is approximately 21 inches long and 16 inches wide. It should be about ¼ inch thick. Preheat oven to 400º F and position a rack in the middle. combine the brown sugar and cinnamon in a bowl. Spread the softened butter evenly over the surface of the dough, and then sprinkle the cinnamon-sugar evenly over the surface. Working carefully from the top (a 21 inch side), roll the dough down to the bottom edge. Cut the rolled dough into 1 ¾ inch slices and place 6 at a time, evenly spaced, in a lightly greased baking pan. Let the rolls rise again until doubled in size (about 30 min.). Bake for 10 minutes, or until golden on top. While the rolls bake, mix the butter and cream cheese in a large bowl with an electric mixer on high speed. Add the powdered sugar and mix on low speed until the sugar is incorporated, then add the milk and flavorings. Mix on high speed again until the icing is smooth and fluffy. When the rolls come out of the oven, let them cool for about 10 minutes, then coat generously with the icing. What beautiful photos, congratulations for your niece! and the cinammon, in the week I make the recipe! Happy Birthday to Lea! She is definitely following her aunt's footsteps. You must be very proud! What a sweet darling! Happy Birthday to Lea! You must be one proud Aunt! With a roll model like you, why am I not surprised that she is so inspired!! Happy Birthday young lady!!! Happy Happy Birthday for Lea! She is wonderful! dreaming my little B one day will do the same, with the same love for cooking. What a beautiful young lady. You are so right, turning ten is a big deal and it only seems to accelerate at a heart-stopping rate after that. It must be so exciting for you that she takes an interest in cooking and photography! I see a lot of girl bonding your future. I can see why you have such a proud Aunt. I'm just letting my cinnamon buns rise for the second time right now! What are the chances? Great post. She is precious. Happy Birthday to the birthday girl. Don't you love being an auntie? It's the best job! So sweet! I have two little nieces whom I adore, too. Oh darling Helen, she's beautiful. This really made me teary, seeing the love you have for your niece. It also made me ask my 7-year-old nephew out for a hamburger this week. I want more time with him too. thank you for linking to my cinnamon rolls recipe. you're the best. Helene, this is a very sweet and warm post with equally great pictures. She's lovely. I'd love to make cinnamon rolls too, but my family isn't that fond of cinnamon, so i always think twice before i add any in my baking. oh how cute. It s nice to have such an enthusiastic cooking buddy :) those rolls look good. I loved this post, I have the same feelings for my 5-year-old niece, I just think she's so beautiful! I think it's time your beautiful niece gets her own blog! You can see the dedication and fun in her face! Love the cinnamon rolls! Looks like you had a really fun session with her! Love it! 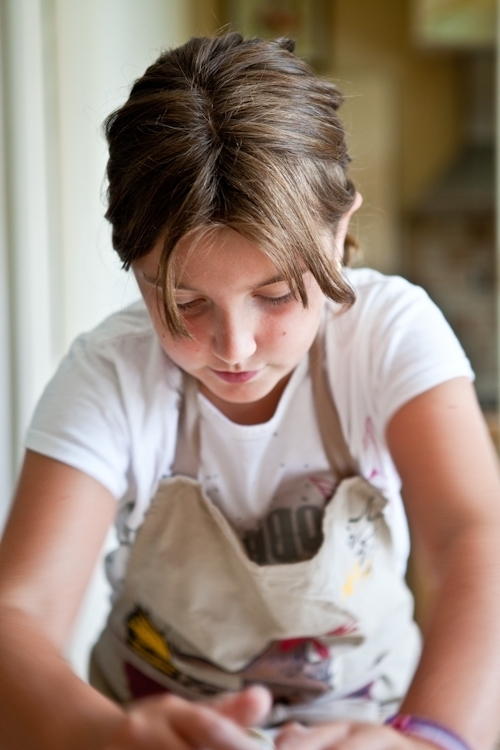 Lea reminds me of my daughter - she's six but she loves to bake as much as Lea does. It's so good we can keep these moments on photos. At least. Happy Birthday, Lea! 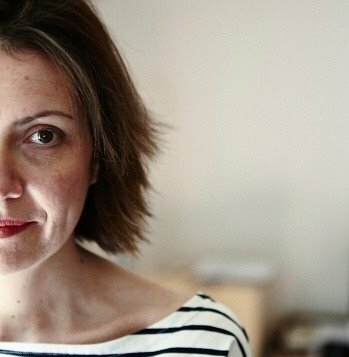 Elle se débrouille comme une chef! Et j'adore les cinnamon rolls, voilà bien un goûter vraiment parfumé! This makes me so happy:) I have two little girls and you remind me of their auntie. I'm always amazed at how much she loves them like her own. It's one of life's greatest blessings to know they have more than us parents to love them like that! What a beautiful post! She has got the best role model to look up to. Thank you for the recipe! I'll have to try this one soon! How sweet! What a great way to spend some time together, bonding in the kitchen. I bet that you made her feel very special. I hope she has a happy birthday. I am visiting after a very long time and I must say I have a sweet craving now. This is a really sweet post! 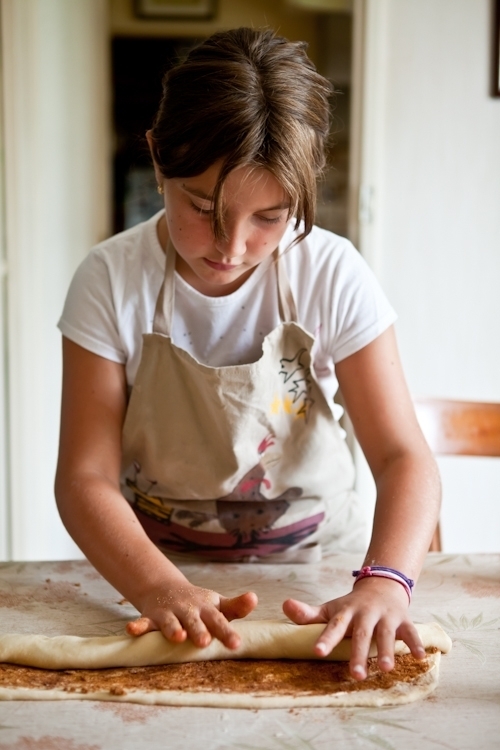 I love when kids take to cooking and baking and fall in love with it. Lovely! They look gorgeous, but I especially love the serious expressions on your niece's face as she made them. And how cool that she photographed them too! This is a beautiful post. 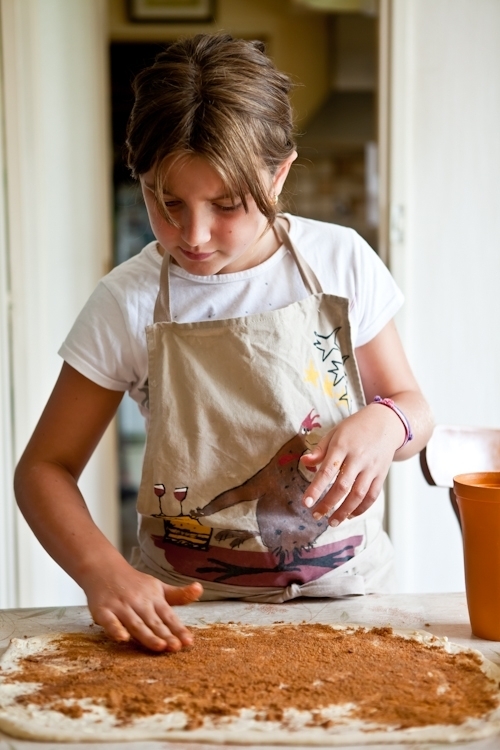 Cooking with kids is something I find amazing. These look delicious! How long will they keep for if stored in an air tight container? Should they be refrigerated? Aww, what a sweetie! Good to see her starting so young, and with the photos too! This is darling! I love that you caught her photographing her Cinnamon rolls, can't wait to try them! That is such a cute story. I love the recipe. I'm just starting to learn how to make breads and was thinking of cinnamon rolls. 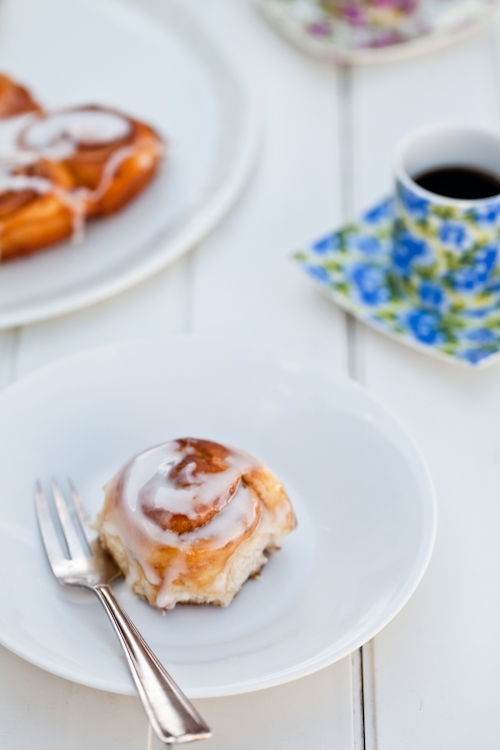 This cinnamon roll recipe couldn't come at a better time. Thank you Helene! And happy belated birthday to Lea, the budding baker & photographer! she is beautiful...and already a good baker, too! happy birthday lea! What a sweet post :) Your niece is adorable! Kudos to nurturing her food bug. Very touching post! Happy Birthday to Lea! She is gorgeous, your photos are gorgeous and those cinnamon rolls are gorgeous! What a lovely post about your sweet niece. I love the line about their lives being loud, chaotic, and imperfect. 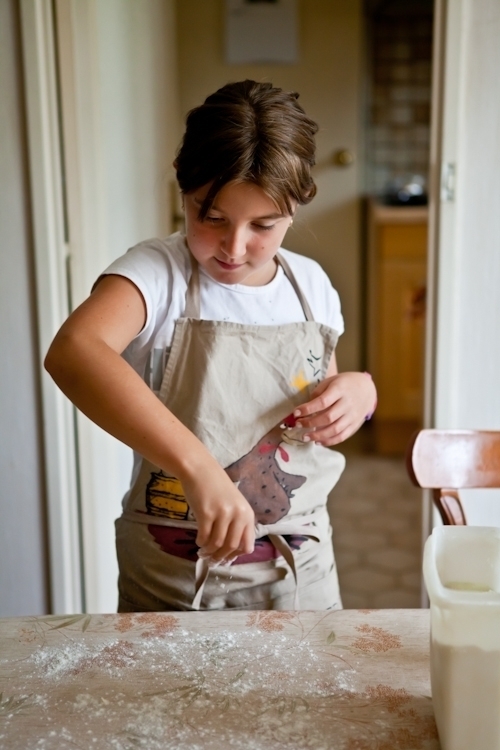 It looks as though your niece enjoys baking as much as you do. She is adorable and the buns look yummy! This is so sweet :) What a lovely post! Lovely story. And she does look adorable. She has a good photographer teacher...! The rolls look so delicious. I love cinnamon rolls. I love cinammon rolls, and your nices is so cute, she bakes like a professional!!! !Lovely pics!!! aw she is just beautiful. ten is such a funny age, just between girl and teenager. it looks like she is having a great time here, thanks for the window on this lovely moment! Thanks for sharing. My mom loves cinnamon rolls so much I have to try and bake some for her! this post really made me smile-thank you! My 12 year old son came to me yesterday with one of my cookbooks wanting to make cinnamon rolls and then I read your post about the same thing. We have plans to make them this weekend, and I will be using my camera! Some of my favorite memories as a child involve cooking. Nice job! Those look really delicious. Looks like she might have her own food blog soon! and she sure does look a lot like you! J'ai fait cette recette pour l'anniversaire de ma mère. Ils étaient très bon mais je pense qu'ils auraien peu être meilleur. En effet, la pâte n'a pas levé comme indiqué. j'ai utilisé de la levure classique, croyez vous que de la levure de boulanger aurait mieux fonctionné? Laetitia: la recette liste la levure de boulanger (yeast) pour les faire monter. La levure classique est "baking powder" en anglais. Vos photos et recettes sont de plus en plus belles. un petit mot pour dire que ces rolls sont tout simplement exquis! Et que dire du glaçage..une pure merveille! J'ai déjà essayé plusieurs recettes des rolls mais celle là définitivement elle a le palmarès #1!!! merci pour la recette! My class is having a potluck the upcoming Monday, and now, I know what I'm making... CINNAMON ROLLS!! Mmm mmmmmm, I know that everyone will enjoy this. Thank you!